I am always very impressed when people can transform very ordinary objects into something anything but ordinary. This amazing sculpture is made with the common staple. Fantastic. From one of my favourite blogs, oliveloaf design. Go see her blog for more photos and details. I mostly agree with the approach put forward by the teacher in this article in the NYTimes (The Future of Reading – ‘Reading Workshop’ Approach Lets Students Pick the Books). I think the important thing is to first get kids to read, and then secondly get them to read books that teach them how to read better. Reading stale classics from the Canon will discourage reading. But kids should also be challenged to read more than what they like. In High School I read and loved all of the Shakespeare plays that I had to read. But the list of those plays that we read was very short. And if I had decided to read King Lear instead of Romeo and Juliet, or Henry V instead of Julius Caesar, would that have been a bad thing? Same with poetry, short stories, etc. With the coming of digital books and other means of accessing the classics, it would be better if kids had more freedom to pick what they want to read, with the teachers providing them guidance as to what they are reading and why it is relevant. I am off on vacation, but I wanted to post this series of very smart ideas in one smart video. Kudos to Element Skateboards for running with this. Check it out. Plus it has a great track over it (from the Postal Service). Yes, its a Wood-Framed Bicycle. You can see more photos and get the details from Gizmodo. I like how the director of this video uses split screen really effectively to make what could be something very static — an acoustic guitar player — something very dynamic. It also gives it a nice 1960s vibe, though it feels new. I wonder if the musician likes Paul Simon? Anyway I like this song, and I really like this video. Sounds vaguely ominous, yes? 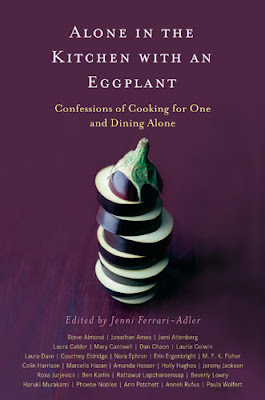 In fact, it is a title of a great looking book, containing essays and articles by writers talking about dining solo. Sounds like the perfect thing to eat with eggplant parmigiana. 🙂 Actually I confess that the thing I like to make when I am eating alone is steak frites with a rich glass of red wine, followed by some good dark chocolate. Or an omelet and a green salad and a glass of white.